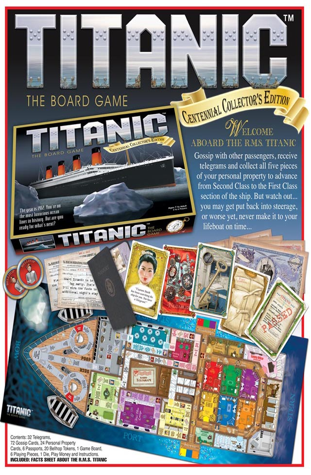 Titanic games are an excellent way for you to engage with your loved ones in the timeless story of the Titanic. 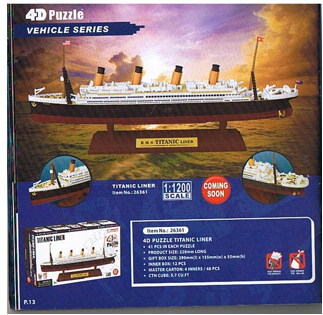 We currently offer both a Titanic Board Game, as well as a Titanic 4D Puzzle. Welcome aboard the RMS Titanic. Gossip with other passengers, receive telegrams and collect all 5 pieces of your personal property to advance from the Second Class to the First Class section of the ship. 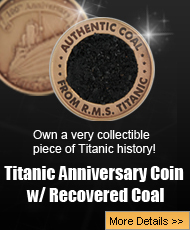 But watch out, you may get put back into steerage, or worse yet, never make it to your lifeboat on time. Contents include: 32 Telegrams, 72 Gossip Cards, 24 Personal Property Cards, 6 Passports, 20 Bellhop Tokens, 6 Playing Pieces, 1 Die, Play Money and Instructions. At this time we only ship within the United States. We ship USPS First Class, which typically takes 3-5 days to arrive once the order is received.